Photography is about capturing light. When there is no light, then there is no photograph can be made. Therefore it is very important to pay attention to the light, the quality of light will be one of the determining factor toward image quality. Quality of light. What does it mean? The word "quality" here, is not referring whether the light is good or bad, but associated toward its suitability for certain type of photo-taking. For example: a very contrasty light may be bad for a family portrait, but it can be very nice for an artistic portraiture. The quality of light is determined by four parameters: eveness, brightness, color, and direction. The leftmost image, was taken with evenly distributed light, while the rightmost image was taken with a hard-light. See the difference of its shadow. The one taken using soft-light, created almost no shadow at all, while the one taken using hard-light has the most prominent shadow. The hard-light is usually useful in revealing textures on a complicated surfaces, and also in the high-contrast photography (we will look further about this on another chapter). Brightness Although the camera can be adjusted to maintain a correct exposure, but there is a limit where the camera may not be able to record faithfully if the light is too dim. Insufficient light brightness will result in higher noise, or grain in film. This is undesirable for most photography, especially macro photography. Most of the objects, including miniature-models, do not emit its own light, but reflecting the light from other light sources. Therefore the color of the light-source will influence the resultant color. If the light is bluish, then the resultant color will be dominated by blue component. If the light comes from a tungsten bulb, then the yellow component will dominate. Digital cameras allow the adjustment of white balance, why bother with the light color? Well, the white balance adjustment is not a magic, it can not create colors which were not there in the first place. Let's say we have a model of F/A-18 Hornet in blue color scheme of the "Blue Angels". When we use white light (daylight) to illuminate the model, and take a picture, then we will get a F/A-18 in blue color. But if we use a red light, and take a picture, then we will get a black F/A-18. Why black? because the blue plane did not reflect the red light, so the camera rendered it as black (no light). Even if we adjust the white-balance, it will still be black. White light has all of the color components. The measurement unit is called "Color Rendering Index" (CRI). 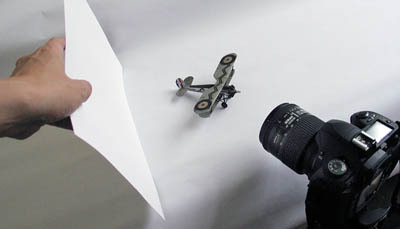 To photograph your miniature-models, use only white light (day light) of around 5000 degree K and minimum CRI of 80. Avoid using halogen or tungsten bulb, unless if you want to create a special effect. Fluorescent light should be used cautiously, because it will cause a greenish hue in the photo. Direction The directions of light relate closely with the eveness. A diffused light is omni directional, which emit the same intensity toward all directions. But if some of the light emit greater intensity toward certain direction, then we start to see a directional light (called "hard light"). using a flash which is attached to it. effectively enhances its texture and shape. This lighting direction is often used to create dramatic pictures. used, placed at the right and left hand side respectively. Both light sources emit the same intensity. The result is a nice photograph, we can see the texture and shape, without excessive shadow. Two light sources and soft boxes create a very soft light, there is no shadow, and the figure is illuminated evenly. 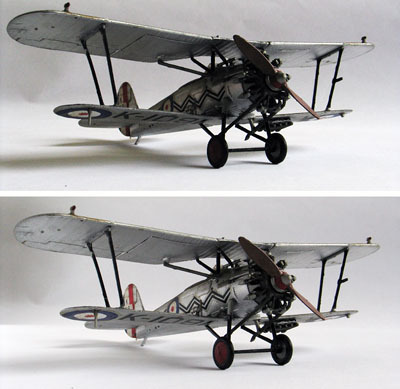 Soft lighting will works for most of the miniature-models, although it may not enhance the texture and shape dramatically. If you only have one light source, but do not want the contrasty result of a side lighting, then you need a reflector. The reflector will be used to deflect the light from that single source, to illuminate the other side of the object. You can use almost anything as the reflector, as long as it is white color. A piece of paper is the most convenient and good enough for small size model. A piece of white paper was being used as a reflector. The light source was on the right hand side, natural light coming thru the window, and the paper was positioned so that the reflected light will illuminate the shadow area. This simple method works nicely. Photographs on the left show the difference a reflector can make. The first photo was taken without reflector, a single light coming from the window. While the other photo was taken with a paper reflector (as shown above). The one taken with reflector is better, with the detail of aircraft's body clearly visible. So at the end, what kind of 'light quality' which is best for miniature models? There is no such thing as "the best". All kind of lights have its own character, and you may choose the one suitable with the theme you want to create. The most important is: you understand about the quality of light, and able to use it as a tool to create pictures of your miniature-models.